Do not underestimate the impact of time on your wedding—your time, as well as that of your helpers and vendors. Just like money, there is a finite amount of time that must be spent wisely. Consider “opportunity cost” before deciding to spend your time on a particular activity, thus giving up the chance to do something else. Having a completely DIY wedding can actually have a negative financial impact. You do not necessarily save money by doing it all. Think big-picture: If the money or other benefits you give up by doing any piece of the wedding yourself is more than the cost of a professional, then it is actually cheaper to buy premade or outsource the project. For example, if you take time off work without pay to complete DIY projects or coordinate, the opportunity cost is the wage you would have earned by going to work instead. And if buying instead of making the items is less than what you would have earned by working, your best decision is to buy. The same is true when it comes to a wedding planner or other vendor. Time spent sourcing flowers, cooking, or coordinating takes time away from other activities. 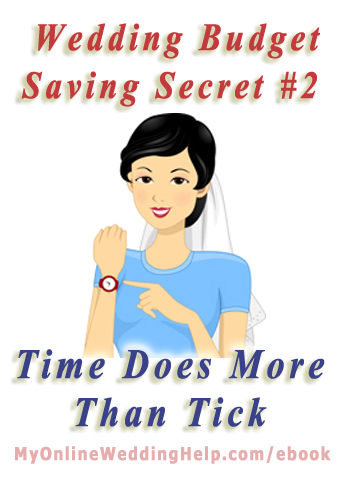 Throughout the Dream Wedding on a Dime; 7 Secrets for the Budget-Savvy Bride ebook I have marked select tips with “(Secret: Time savings).” These are time-management tips. Go to MyOnlineWeddingHelp.com/ebook for more information about the ebook.